Showcasing the possibilities of holograms in Windows 10, Microsoft HoloLens is the world’s first untethered holographic computer – no wires, phones or connection to a PC needed. CMOs should be paying close attention to Microsoft’s new HoloLens technology as it is set to change the way consumers interact with brands, industry pundits claim. During the global launch of its Windows 10 platform today, Microsoft surprised media and analysts by announcing the inclusion of a holographic interface that will launch with a dedicated headset for consumers and enterprises. The wearable enables the user to view high-definition holograms with surround sound and understand voice commands and hand gestures. Commenting on the news in a blog post, Forrester vice-president and principal analyst, James McQuivey, said mixed reality will change the way brands interact with consumers over the next five years. The analyst group also expects to see further holographic capability offerings on the way from Apple and Google. “HoloLens will expand the way brands interact with consumers forever more, working its way through industry after industry much the way Web and mobile experiences did before it,” McQuivey wrote. McQuivey compared HoloLens’ potential impact on the way people interact with machines to the rise of the mouse-based interface in the 1990s, and touch interfaces after the introduction of the iPhone in 2007. According to Forrester, the first users of Microsoft’s are likely to be media and entertainment and gamers in particular, “eager to experience the next big thing”. Stefan Pernar, president of the Australian Virtual Reality Industry and managing director of consultancy, Virtual Reality Ventures, said the industry is in the “marketing stunt phase” of virtual reality technologies right now, but also expected real benefits for marketers around consumer engagement in the medium to long-term. “The amazing thing about the current wave of immersive technologies, such as the just announced HoloLens, is that they have the potential to touch otherwise jaded consumers on a visceral level,” he told CMO. Pernar estimated just 1 per cent of consumers have experienced virtual reality to date. For example, an early piece of research by Suh, K., & Lee, Y. E, entitled The effects of virtual reality on consumer learning: An empirical investigation and published in MIS Quarterly, found 71 per cent of participants most wanted to buy a product that had been represented in VR, while only 29 per cent preferred the products in the static space. “There are real benefits to be had from consumer engagement in VR that are backed up by peer reviewed studies. Companies that start to think about a meaningful integration of VR into their marketing strategy right now will stand to reap the most benefits,” Pernar said. There’s also plenty of scope for immersive technologies such as HoloLens to have profound implications on the enterprise, Forrester analyst, JP Gownder, said. “[HoloLens] will offer many of the best features of virtual reality and augmented reality, giving business leaders a powerful new tool to enable workforce scenarios like remote collaboration, field work, and training,” he wrote in a second blog post following Microsoft’s announcement. IDTechEx technology analyst, James Hayward, suggested the timing of the HoloLens announcement is key. "The predicted death of Google Glass has left many disillusioned explorers that are ripe for the taking by Microsoft," he commented. "While many comparisons are being made, I think the HoloLens is a very different product to Google Glass. 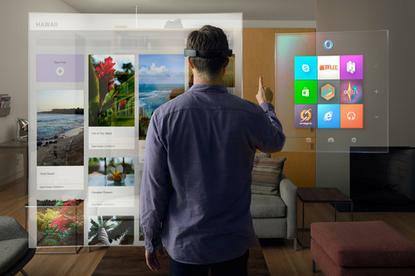 Glass was designed to be worn all the time as a useful addition to normal life, whereas the HoloLens has much more active interaction, with the device removed whenever the user is finished with the application. This drastically changes the hardware requirements, particularly around power consumption." Hayward said HoloLens also comes at a time when the use cases for augmented reality devices are gradually becoming clearer. "However, its fate will depend on both the display quality in the final product, and whether developers can come up with useful apps," he said. Even if Microsoft’s HoloLens device fails, much like its early forays into tablet-based computing and smartwatches, holographic computing is going to succeed, McQuivey claimed. The new of HoloLens comes just a week after Google took shut down its Google Glass Explorer program and took the product off the market, prompting many to question what the long-term future of Google Glass may be. McQuivey will be the keynote speaker at CMO’s first Executive Connections event this year on digital disruption for CMOs and CIOs, brought to you in partnership with ADMA. The event will be held in Melbourne and Sydney on 24 and 26 February and is free to attend. Don’t miss out and register today at: http://www.cmo.com.au/digital/ (#execconnects) .